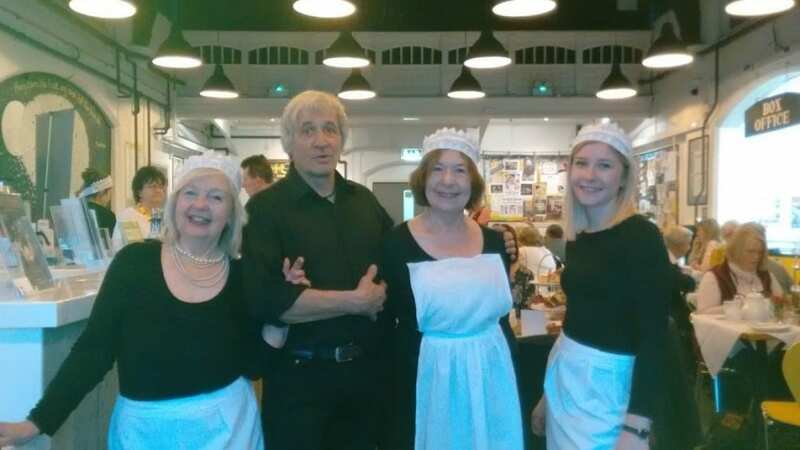 The grandson of the last manager of the House of Powolny invited us to a celebration in our local Beverley theatre cafe. It was a memorable occasion. The first in a line of immigrants, Ernst Adolf Powolny left Saxony for Leeds in 1859 aged 17 to seek his fortune. He founded a restaurant which acquired a reputation for the best food and quality of service in town. Powolny’s became ‘a name to conjure with’, and in 1903 a branch opened in Kingston-upon-Hull. The Hull Daily Mail announced that it contained a handsome grill, dining and smoke rooms, and ladies’ dining, withdrawing, reading and retiring rooms, luxuriously furnished. Like its Leeds counterpart, the menu ‘specialised in soups of every description, especially turtle, hot and cold ornamental entrees, fancy ices, aspics, patisserie, pâte foie, bonbons, chocolates, savoury and sweet jellies, creams, trifled viands, all made on the premises by competent chefs and able to be packed securely and travel any distance’. The manager was Monsieur Charles Colomb from Neuchâtel, Switzerland, who had worked in restaurants in Geneva, Monte Carlo, London and finally Hull. Its splendid Edwardian interior welcomed the grandees associated with the local scandal over alleged cheating in a game of baccarat when Edward VII visited the Wilsons, a wealthy local shipbuilding family.The premises contained acres of mirrors, polished oak panelling, chandeliers and endless shelves of bottles and glasses all spread over three floors and tended by 89 to 100 staff. Although it suffered some bomb damage from German airships during World War I, it remained open. In the 1920s the first floor was turned into a ballroom for jazz and the Charleston. Musicians played in the gallery from 3 to 5 pm. for the popular Tea Dances Between the wars there were subtle changes. ‘High class’ changed to ‘The Best’ and ‘the most convenient’, and the restaurant became ‘Polly’s’. The last manager, our friend’s grandfather, was Petro Louis Dermond from Smyrna. He was born in 1907 in what was then the Ottoman Empire, came to England to seek his fortune and married 19 year-old Anne Birchall from Durham, ending up as manager of Maison Powolny. His son followed him at ‘The place to be’ when World War II broke out and Hull was again bombed. Polly’s remained open and on that warm afternoon in May 1941 the dance floor was full of soldiers and local women. In the early hours of the morning the sirens wailed and the bombing started. Polly’s suffered a direct hit and never opened its doors again. Where is THE place to be now? Restaurants and cafés open and close nowadays with bewildering frequency. Food is consumed hastily in company before the theatre or cinema. People work all day, social life is banished to the evenings or, for the family, the weekend. For one Sunday afternoon we returned to the lace tablecloths, cake and sandwich stands, tea and coffee and waitresses in black dresses with white lace pinafores and headbands – Maison Polowny recreated! Although I have been out of touch for quite some time, I just wanted to let you know how much I enjoy your delightful short commentaries on persons, places, and things. I look forward to your next novel. And, of course, I remember fondly our time together on Easter Island.